Walls a constructed of different materials in different buildings. 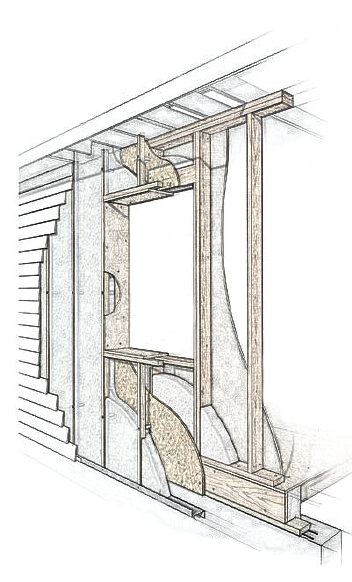 A Wall Section is a technical drawing that lets you see inside a wall. Rarely will a wall be made of just one solid material. Most often what you see on the outside is not all there is on the inside! A lot of materials are put together to ensure that the wall holding your house up can also keep you warm and dry in the winter and cool and dry in the summer. Walls come in all shapes and thicknesses and vary widely in their sections. Some walls use wood for the structural system. Others use CMU (concrete masonry units or blocks). Some walls use combinations for exterior finish and weather resistance, thermal (temperature) barriers, and thickness (or mass). Many buildings use brick and/or stone while others use light metals like aluminum or strong metals like steel. There are many material options, but what’s important is how these materials are put together to ensure that the building stands up and the weather outside does not reach inside. Take a brick exterior wall for example. Today brick construction is usually paired with CMU for main structural support. But inside there is also an air cavity, which helps keep the transfer of heat to a minimum. Inside the air cavity is insulation, which reduces temperature transfer. Then there is a vapor barrier, or a thin sealant that keeps moisture from entering the building. All of these material layers take up just a few inches between the exterior and interior wall. 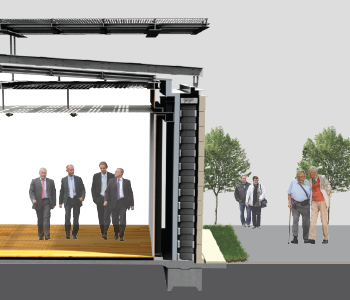 Wall sections provide our structure, our comfort and our protection from weather! Get out of the house and explore! Look for different walls made with different materials. Make a list of materials for outside walls. Now go inside different buildings like your house and your school and your library. What materials are used for interior walls? Most outside walls are thicker or wider than interior walls. Some walls are made of repetitive parts like bricks; others are made of sheets of material like wood or metal. Take a picture of at least 6 different walls and make a list of the materials you can see on the inside and on the outside. Use these examples of material textures. Beside the picture, draw the material as it shown in an architectural wall section and label the materials. Walls are either structural or non–structural. 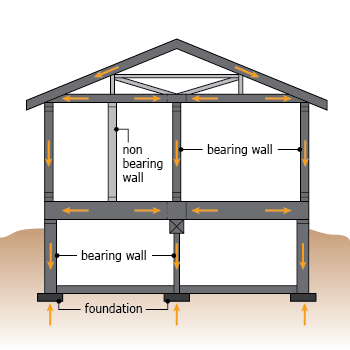 Structural walls are anchored in the ground with foundations and hold up and everything above them including floors and roofs; structural walls carry both the weight of the materials themselves, and also the weight of people, equipment and activities in buildings from the top of the roof to the bottom of the foundations. Other walls are non-structural walls. Non-structural walls are partition or *infill walls and are made of lighter, opaque, translucent and transparent materials. Structural walls are usually thicker than non-structural walls as our exterior walls. Research structural walls. Draw a structural wood wall, a structural masonry or concrete block wall with brick and a metal stud wall like the examples shown. Be sure to show the foundations, walls and roofs. Draw and label all of the materials from the outside to the inside. 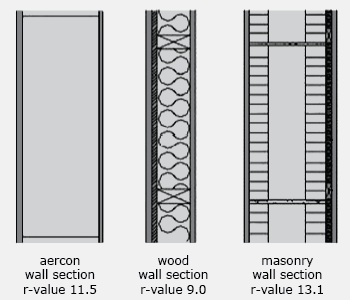 An important factor in designing wall sections is the R-value of the wall. The R-value is the measure of heat resistance in a material or series of materials. It reveals the insulation capability of the wall section. Like a winter coat, If the material has a high value, then it is particularly good at not allowing heat to enter/escape. In general, thicker walls will have a higher combined R-value, but some are more efficient than others. Take a look at ArchToolBox to get an idea of some materials that are good as insulators. Which materials work best together? Draw two different wall sections and label their R-values. Drawing a wall section becomes pretty straightforward until there’s an opening. Buildings have doors and windows as openings in their walls. What does a window look like in section? Windows and doors are the biggest cause of heat loss in a building, so they have to be secured to minimize loss. The three main parts of securing a window frame are its head, jamb, and sill. The head is the top piece of the frame. The jambs are the vertical pieces that are usually hidden inside the wall. The window sill is the bottom part of the frame. Window frames are made of combinations of metal, wood and plastics. The pieces of glass fastened between them can be single pane (one piece) or double or triple paned, with an air gap between each one. The more sheets of glass and airspaces there are, the higher the R-Value! Look at two different window manufacturers and copy their window sections in walls labeling the windows R-value ad well as the R-value of the wall. Now it’s your turn to model wall sections! Grab some materials such as paper, cardboard, foam core, and sheets of light plastic, acetate and wood. Consider how to you different materials such as brick or concrete, wood or steel. Think about how the layers attach. Remember to leave an air gap behind the outer layer. Be sure to add insulation. How do the layers connect and stand together? Most walls have anchors or small rods that connect the layers together at specific intervals. Carefully use wire or a bent paperclip to connect the layers together. Small wooden dowels will work also. Take into account all that we’ve talked about – don’t forget about each layer and considering the R-value. Challenge yourself to add a window and a door too. Use different colors to shade in the different materials. Model two different wall sections and upload them to the gallery. Now that you have an idea of how walls are put together, design your own! Take into account all that we’ve talked about – don’t forget about each layer and considering the R-value. Challenge yourself to add a window and a door too. Use different colors to shade in the different materials. Be sure to add at least one foundation, floor, and roof structure. 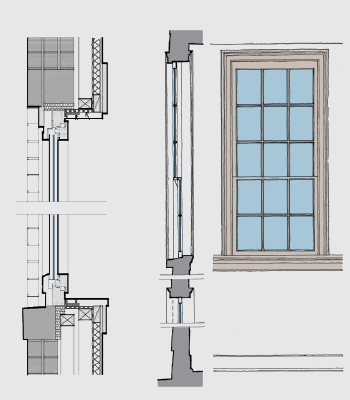 Keep in mind that a section drawing is architectural and requires attention to detail. Objects that are being cut through require a thicker line weight than objects that aren’t. More line weights make a more interesting drawing! More line weights give more material information! The higher the R-value the higher the insulative performance of the wall. A window and door frame connect to walls in three places. Exterior walls are always structural. Infill walls are not structural and are usually thinner in section than structural walls.